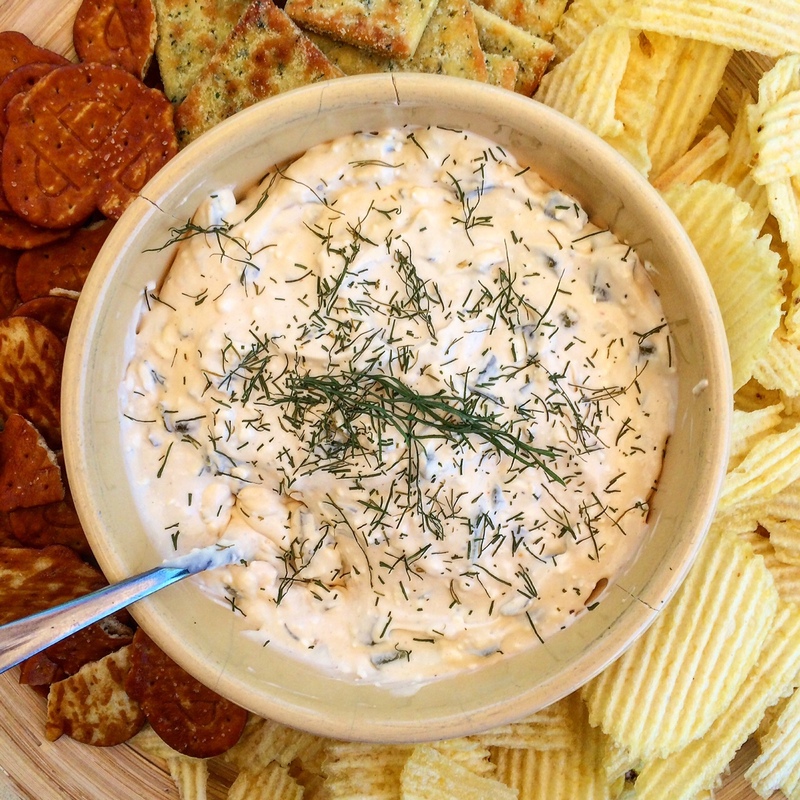 In a medium bowl, mix the cream cheese, sour cream, pickles, Worcestershire sauce, and hot sauce together. Add a couple tablespoons of pickle juice if the dip is too thick and continue to add a little at a time until you reach your desired consistency. Season with salt and pepper to taste and add some fresh dill. Refrigerate at least 1 hour before serving. Serve with chips, crackers, veggies, whatever you like! 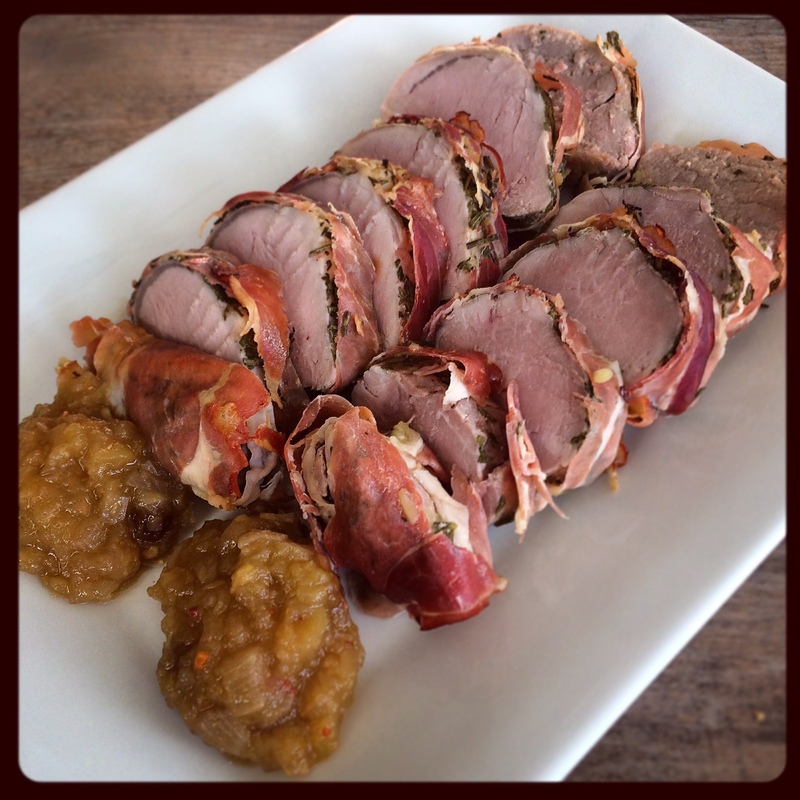 Pork…wrapped in more pork. This is never a bad thing, and when it’s Ina toting a double pork throwdown, you do what she says. We love Pork Tenderloins in our house, and this recipe was super easy to make on a weeknight for dinner. And shhh, I didn’t even wrap the tenderloins with kitchen string, I just wrapped the prosciutto around it as tight as I could and threw it in the oven! I cooked the tenderloins for 25 minutes but wish I had done them for 20, since I like to make sure our pork stays super juicy! 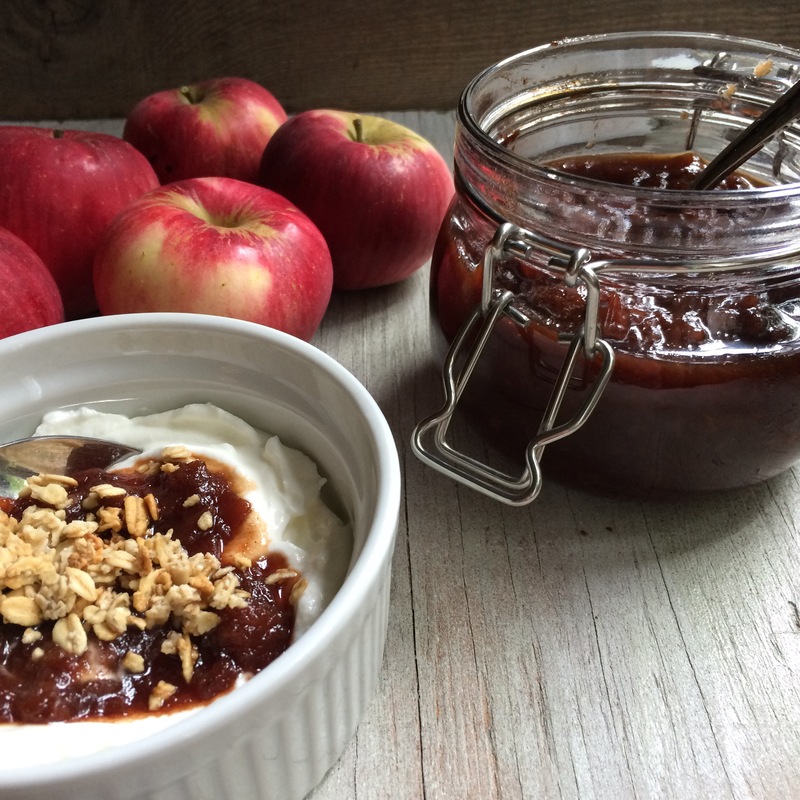 I halved the apple chutney recipe, because there is no way I needed 5 whole cups of it. The pork doesn’t need the chutney, and the chutney doesn’t need the pork. These can be treated as 2 totally different recipes, even though they pair together so well. Place the tenderloins on a sheet pan and pat them dry with paper towels. Combine the rosemary, thyme, 1 tbsp salt and 1 tsp pepper in a small bowl. Rub the tenderloins all over with 2 tbsp of olive oil. Sprinkle all sides with the herb mixture. If there is a thinner “tail,” fold it underneath so the ternderloin is an even thickness throughout. Wrap the tenderloins completely with a single layer of prosciutto. Tie in several places with kitchen string to hold the prosciutto and the “tail” in place. Roast for 20 to 25 minutes, 20 if you like your pork a little more rare, 25 if you like it well done. Cover the tenderloins with foil and allow to rest at room temperature for 15 minutes. 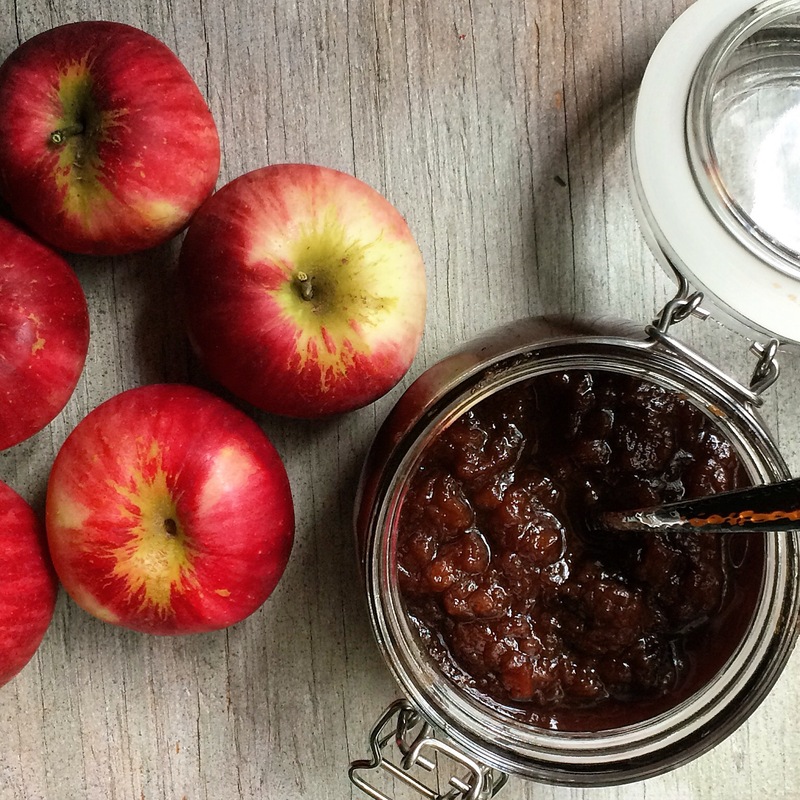 Slice Diagonally in thick slices and serve warm with Apple Chutney. Combine the onion, ginger, orange juice, vinegar, brown sugar, mustard seeds, red pepper flakes, and salt in a medium-size saucepan. Add the apples, adding them as you chop to keep them from turning brown. Bring to a boil over medium-high heat, stirring occasionally. Reduce the heat and simmer for 50 imnutes to 1 hour, stirring occasionally, until most of the liquid has evaporated. Stir in the raisins and serve warm, at room temperature, or cold. 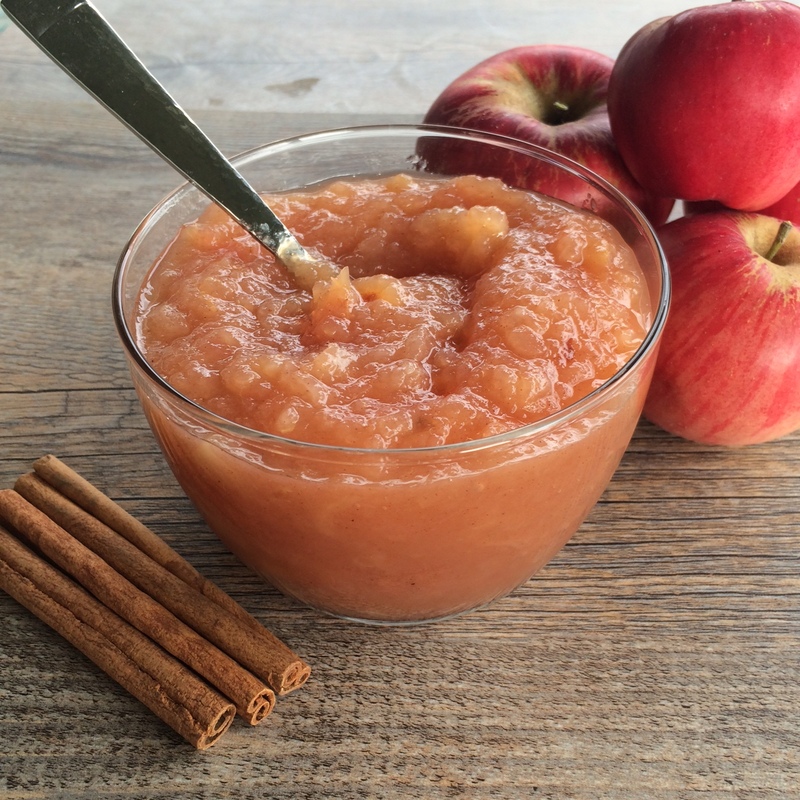 When life gives you apples…you make…applesauce! 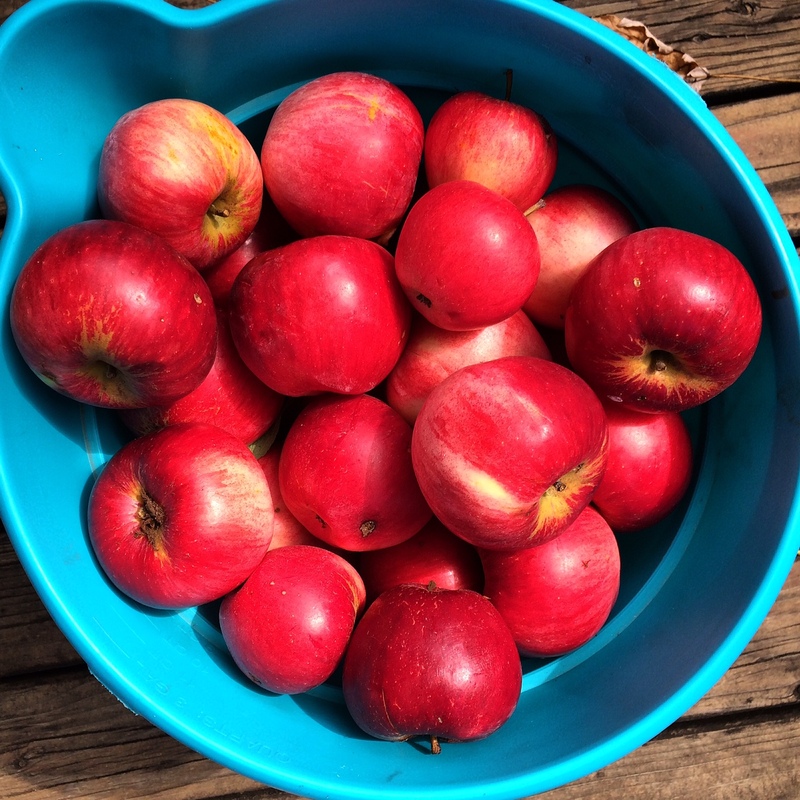 Lulu’s apple tree produced a lot of good (and yes, a few bad) apples this year. While I would have liked to make 10 batches of apple cobbler, I felt like applesauce was a little more practical and healthy. Plus, I had never made homemade applesauce before, and it’s a pretty dang easy, wing-it recipe. From scratch applesauce is also about 130912830912 times better than anything you would buy at the store. I don’t care how cute those little squeeze tubes are! 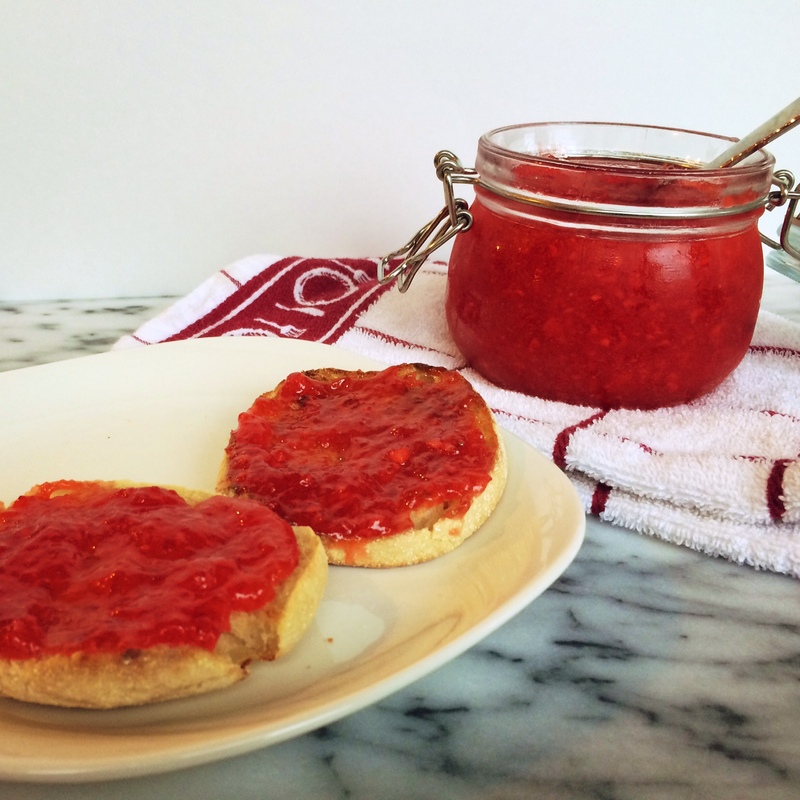 My mom has made this jam every summer for YEARS. I can’t remember when it all started, but as a kid, after my first taste of this jam, there was no looking back. I could officially never eat store-bought strawberry jam EVER again. This homemade stuff was way too good. It doesn’t even resemble the store-bought strawberry jam…you know, that name brand everyone else buys…you just can’t do it after this jam. The proof lies within everyone who has had it, the biggest example being Jordan, who I am convinced maybe decided he was going to marry me after his first taste of this jam. The moment went along the lines of me making him some scones, which he had never had before. Obviously, this plays into the life-changing moment, but then he put some of the jam on top and freaked out. “What is this?!? This is homemade? How is it so good? 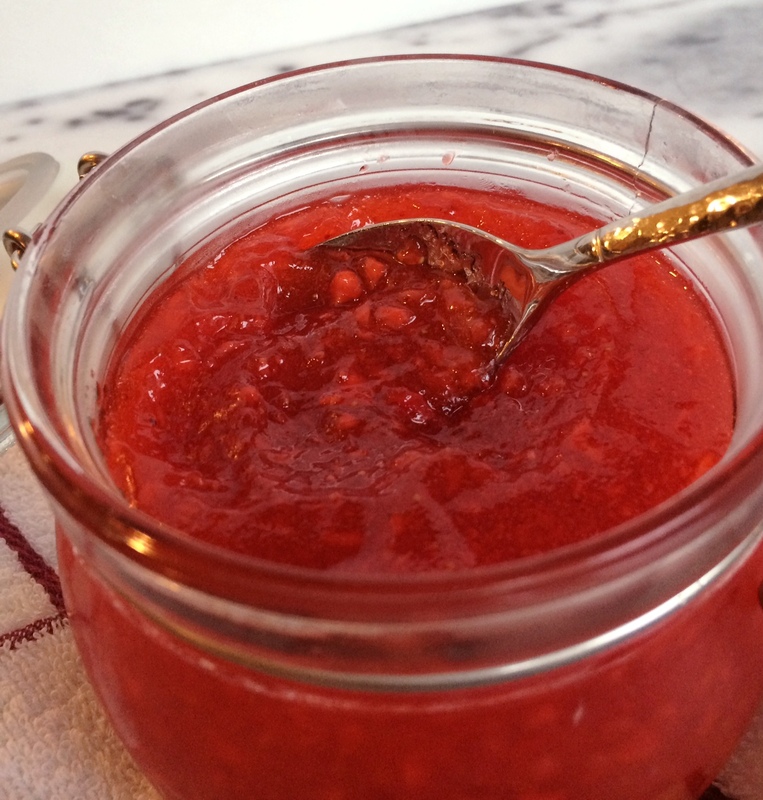 Oh my god, this is the best jam I have ever had.” I couldn’t help but laugh at his jam freak-out…I mean, it’s just strawberries, sugar (a lot), and pectin. Nothing crazy. It’s just one of those things that is a bajillion times better when it’s homemade. Then I told him I didn’t even make the jam – it was actually my mom. Through college (and years after) I still was getting reloaded with jam from her every year. Even through this confession, I think Jordan knew deep down I would be making it one day, solidifying all PB&Js and toast in his future. Or he knew if he stayed with me, I would at least always have an arsenal of jam from my mom. But this year it was finally time! My mom and I made this jam together and it’s super easy, it just takes some time. It’s super worth it and super basic. Like I said earlier – it’s really nothing crazy or special. It’s actually from the side of the pectin box, which is probably why it’s been there for years and is so good. Anyone can do it, as long as you get past the fact it’s about a 2:1 ratio on sugar to berries. Don’t even worry about it – you are eating homemade goodness! It’s better than anything bought from the store. No weird ingredients you can’t pronounce. 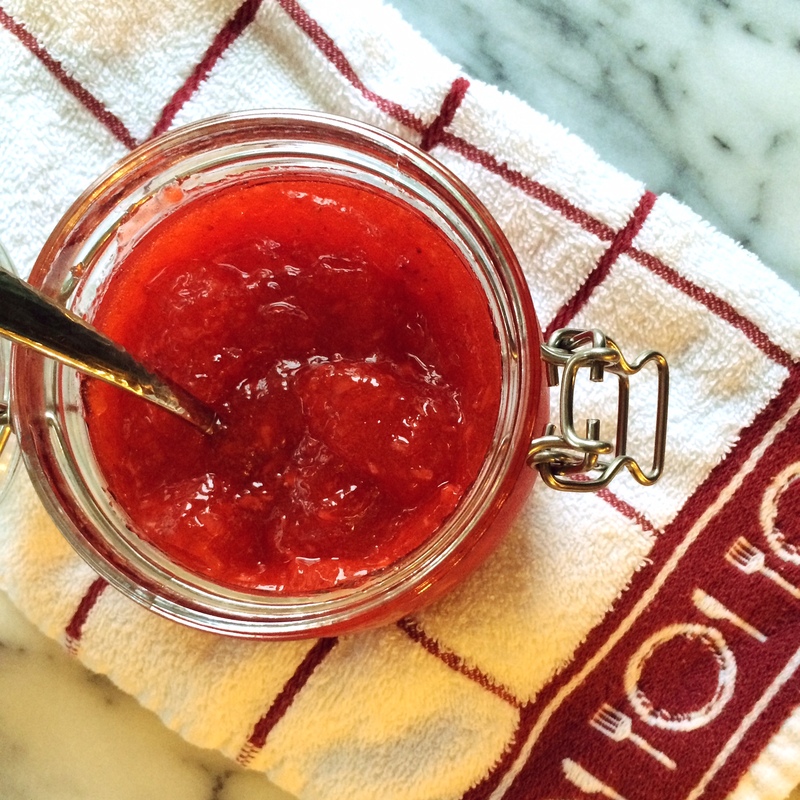 Everything in moderation, people – you may have a problem if you are like my Grandpa (Pompa) who eats this jam by the spoonful and can clear through a pint in a week (maybe days). But hey, the guy is 88 and also has been known to eat butter by itself, so I say just eat some damn jam every once in awhile and you will be okay. Also – this recipe is easily adaptable, the same recipe below can be followed with just about any fruit or combo thereof. Strawberry + mango happened this year, and WHOA. Just remember, 1 part berries, 2 parts sugar, 1 box pectin. We always make a few batches, we use at least 4 boxes of pectin every year so we can freeze, save, and give to friends. But if you are flying solo, 1 batch will keep you going for at least 6 months, maybe a year depending on your jam intake I think the biggest “secret” here is using the best local strawberries you can find. 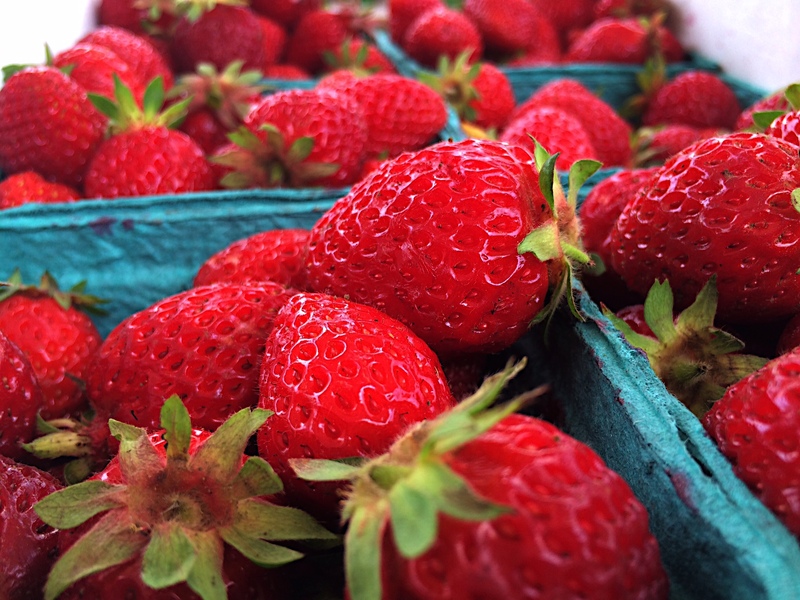 In the Portland area, the local strawberries are different than ones you buy at a grocery store, they are smaller, and much more delicate – they only last about a day after you buy them. 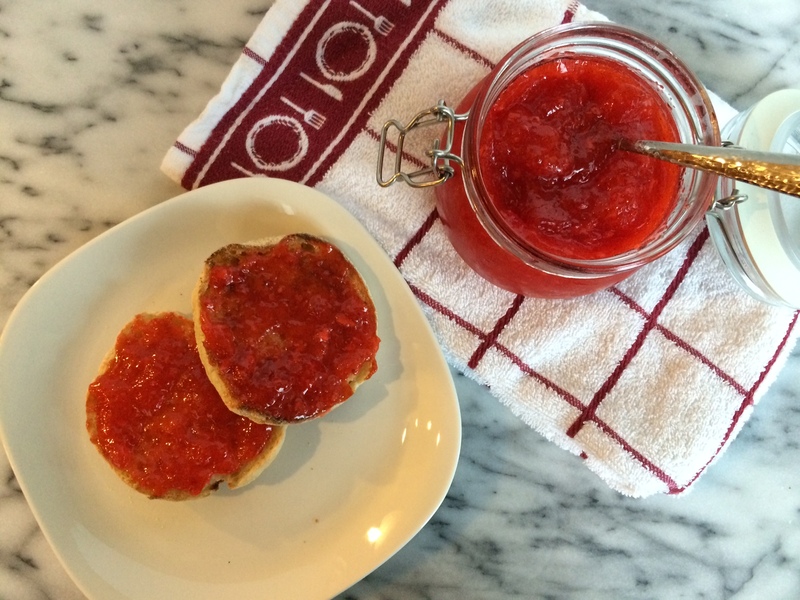 This jam does turn out a little different if you use non-local store bought berries. Go to your farmers market or buy them from a road side stand if you can. 1. Wash and rinse plastic or glass containers with tight fitting lids. You can use 1-2 cup sized containers, or whatever you’d like depending on how many batches you are making. Try to make sure they are freezer-safe, as the jam freezes really well. 2. Prepare fruit. Wash 2 pints of strawberries, discard the stems. Crush berries using a potato masher, or you can pulse them in a food processor. Make sure you only PULSE them, do not puree. Your jam should have nice little bits of fruit. 3. 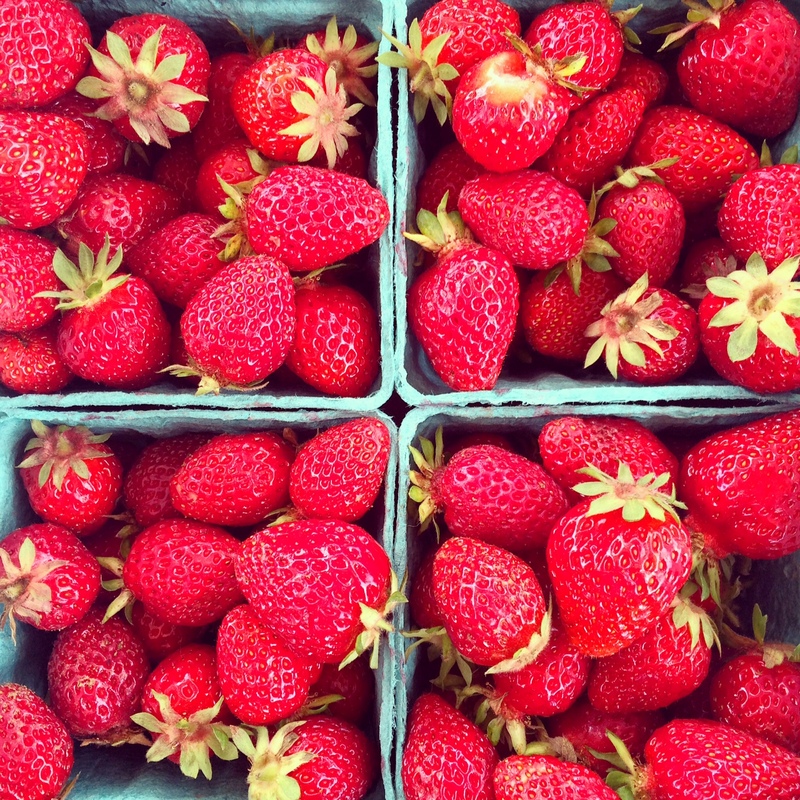 Your 2 pints of strawberries should pretty much measure out to 2 cups crushed berries. Pour the 2 cups of berries into a large bowl. Add 4 cups of sugar to the bowl with the berries and stir well. Let stand for about 10 minutes, stirring occasionally. Do not reduce the sugar or add a sugar substitute, or the pectin will not set! 4. Stir 1 box of pectin and 3/4 cup water in a small saucepan. Pectin may start out a little lumpy but just stir it around a bit more. Bring to a boil on high heat, stirring constantly. Boil for 1 minute, stirring constantly. Remove from heat. 5. Stir pectin mixture into strawberry mixture. Stir constantly until sugar is completely dissolved and no longer grainy, about 3 minutes. 6. Pour into prepared containers, leaving 1/2 inch space at the top for expansion during freezing; cover. 7. Let jam stand at room temperature for 24 hours until set. Refrigerate up to 3 weeks. Otherwise, store in freezer for up to 1 year. Thaw in refrigerator. This jam is good on everything. Scones, Biscuits, Waffles, Sandwiches, stirred into yogurt, you really have endless possibilities! My mom has even used this jam as the middle layers on white cakes. And it’s amazing. 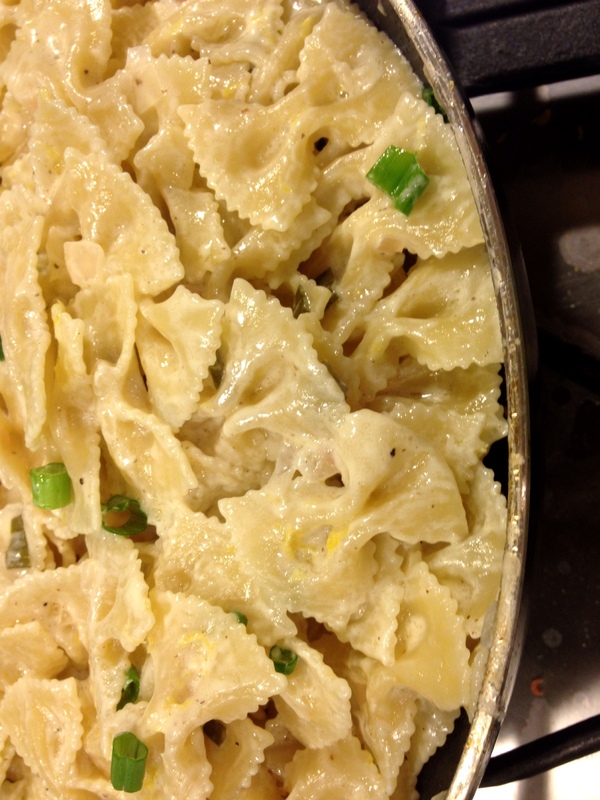 I think if I had an ultimate comfort food dish…this might be it. 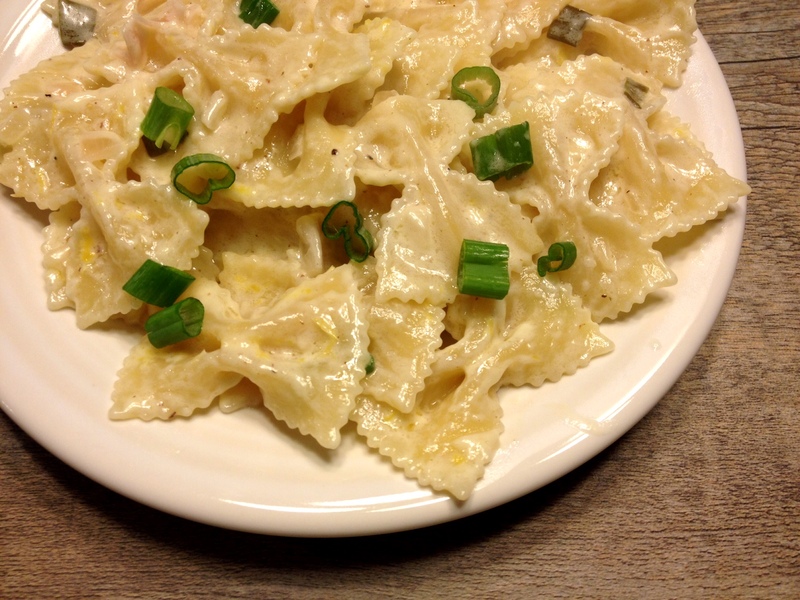 A creamy, yet light pasta dish that is perfect with a glass of white wine…that is exactly what I want when I’m in need of a little comfort after a hard day! This dish also comes together in no time and it’s best to eat it immediately – so make it when you’re hungry! Prepare the pasta according to package directions, reserving a cup of pasta water. Meanwhile, sauté the diced shallots in olive oil over medium heat for 3-4 minutes. Once the shallots have softened, sprinkle with two teaspoons of flour and cook for one minute. Stir in white wine until flour is dissolved and bring to a simmer. 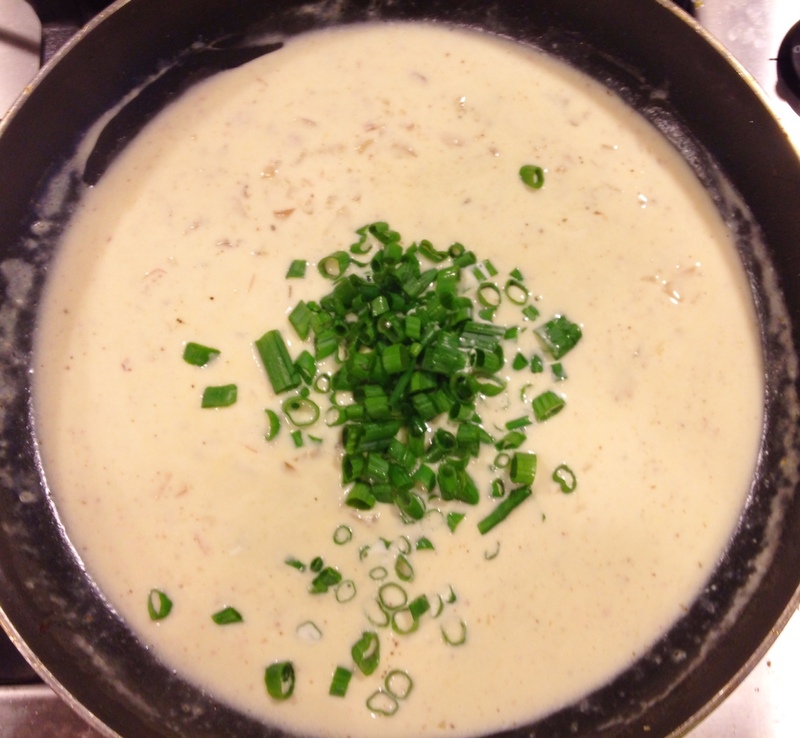 Then reduce heat to medium-low and add heavy cream, lemon juice, salt and pepper. 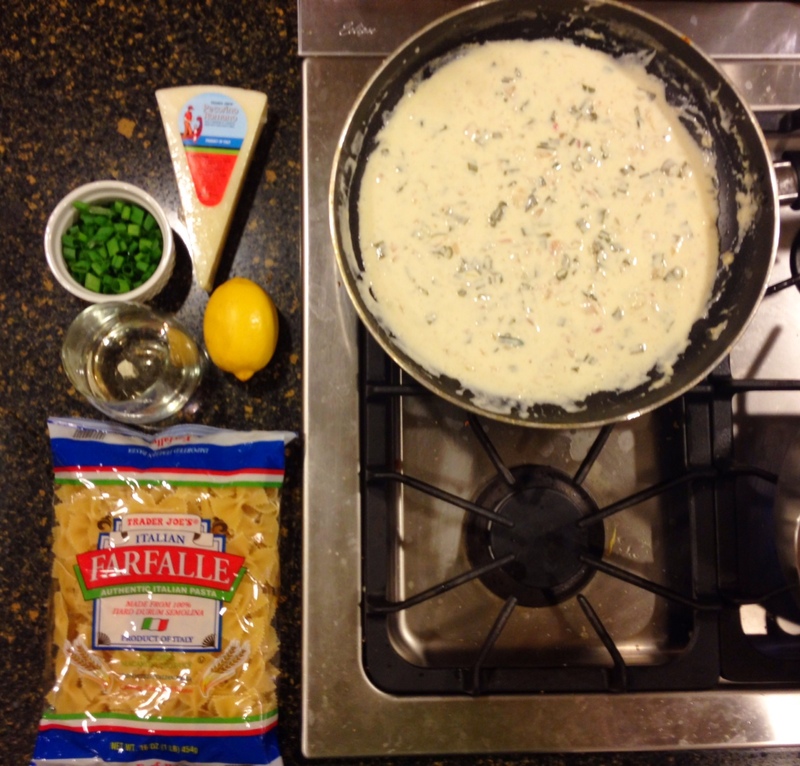 Add the chives to the sauce right before you are ready to add the pasta. 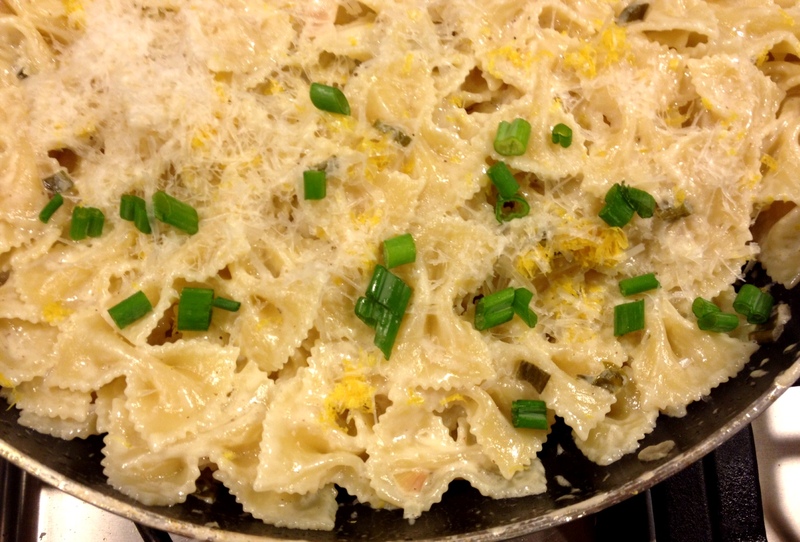 Grate a teaspoon of lemon zest and 1/2 cup Parmesan over the pasta and toss with the sauce. Thin out with a little of the reserved pasta water, if desired. Divide among plates and garnish more Parmesan. This dish is best served immediately. If you happen to be with your “average” American male, chances are he probably likes steak. A lot. I find that it is nice, every so often, to make your man a steak. I mostly think this because 99.9% of the time we eat steak, Jordan is the one grilling it. 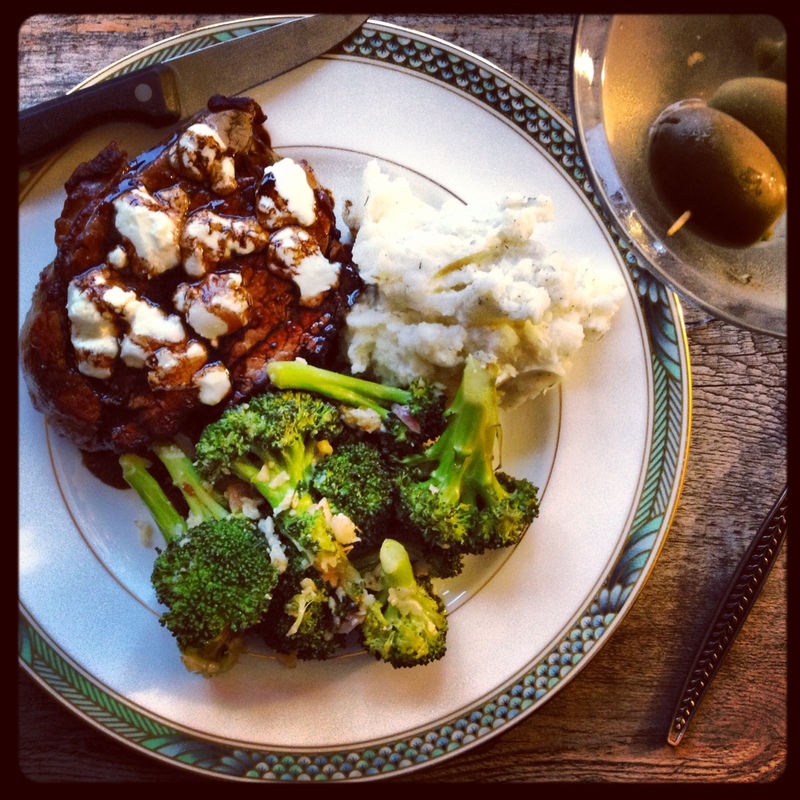 The $75 Steakhouse Dinner: Filet Mignon, roasted broccoli, horseradish and dill mashed potatoes, and a double dirty martini. All made relatively quick on a Wednesday night. Boom! My first Bobby Flay recipe, and it did NOT disappoint! Everyone loved this dish, and it came together relatively easily, despite a few ingredients I never have handy (coconut milk & thai peppers). 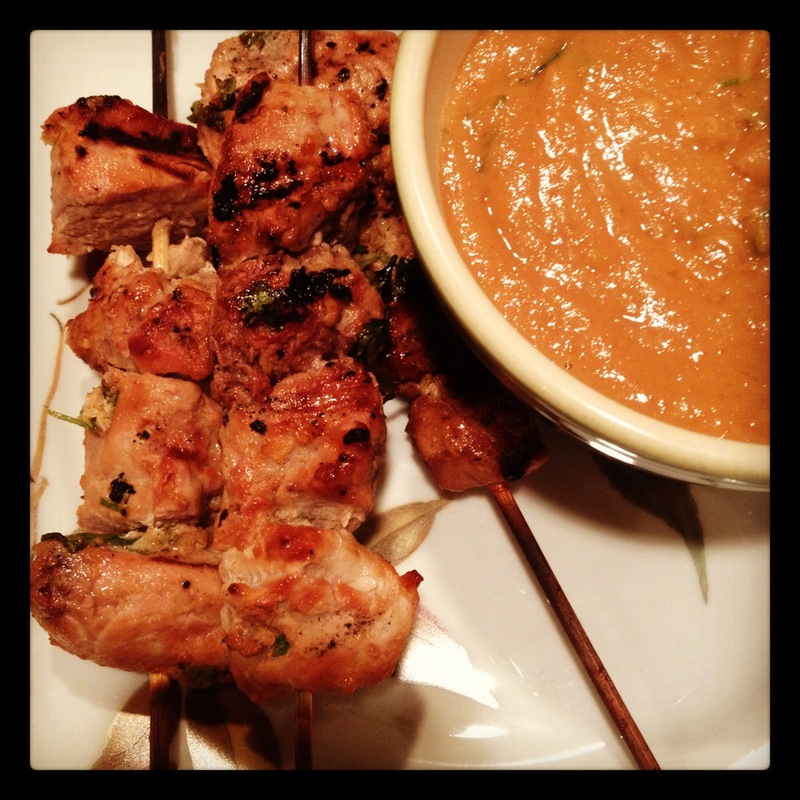 This was great to have for a party, we served these with homemade crab rangoon. Serves 4-6, with lots of leftover sauce! Combine all ingredients in a medium bowl, add pork and let marinate 2 to 4 hours. Heat the oil in a skillet and add the onion, garlic and chili. Saute for about 4 minutes. Stir in the soy sauce, lime juice, coconut milk, coriander, and cumin. Thoroughly blend the peanut butter into the mixture. Bring the sauce to a simmer over low heat, stirring frequently. Stir in the cilantro and remove from the heat. 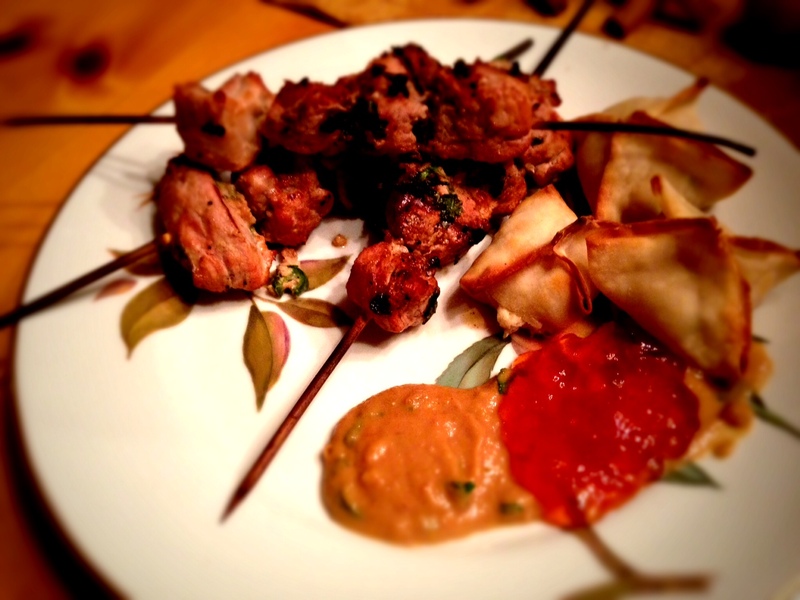 Remove the pork from the marinade and thread on skewers. Grill for 7 to 8 minutes or until cooked through. Serve with the sauce. 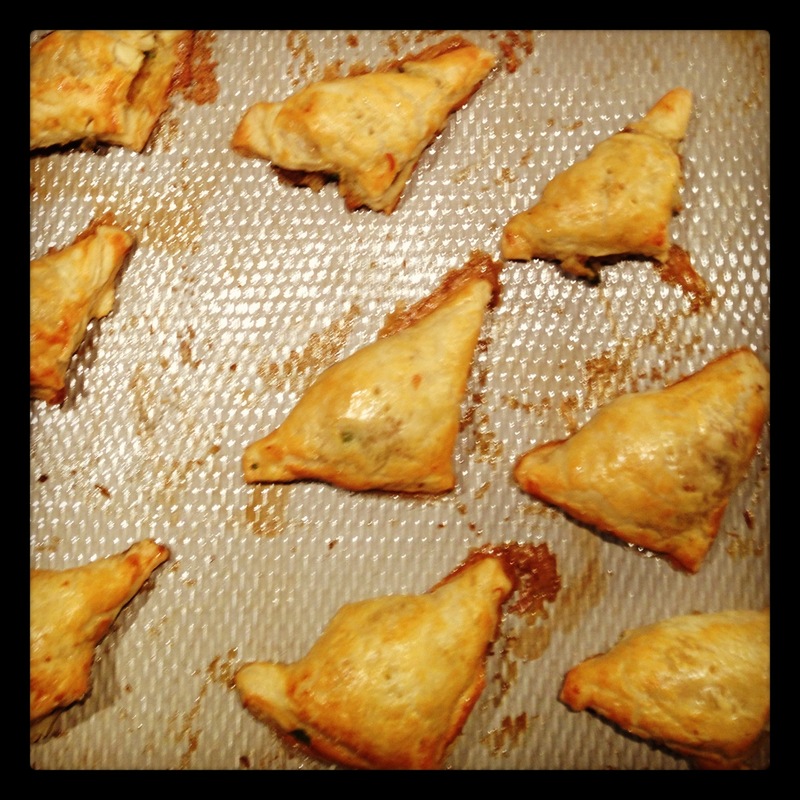 the surprisingly amazing leftover Thanksgiving Samosas. What if I were to tell you there was a super easy, almost fool proof Thanksgiving leftover recipe out there that was totally original and made you feel like you weren’t actually eating leftovers?!? 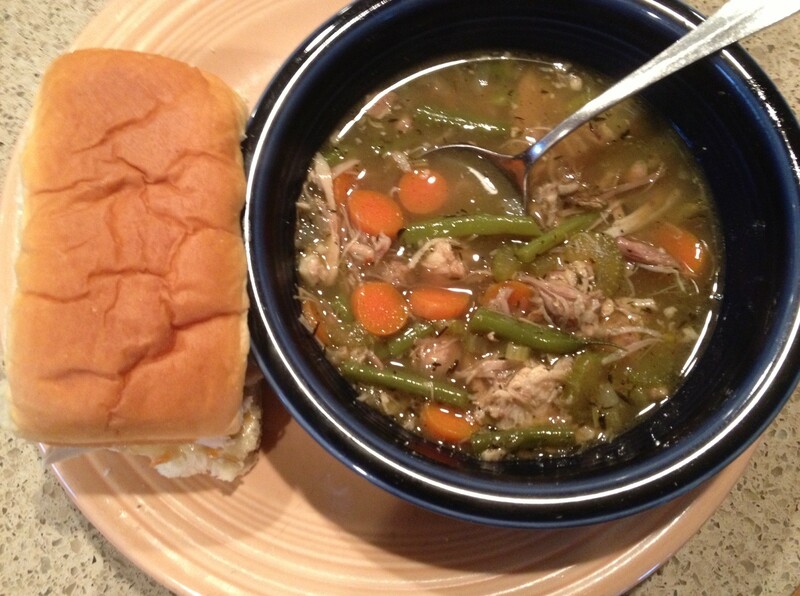 Your typical Thanksgiving leftovers…turkey soup and turkey sandwiches. Still good! But not as original as these Samosas. Yes, turkey soup and turkey sandwiches are incredible. But on day 4, they start to get a little old and you realize why Thanksgiving only comes once a year. 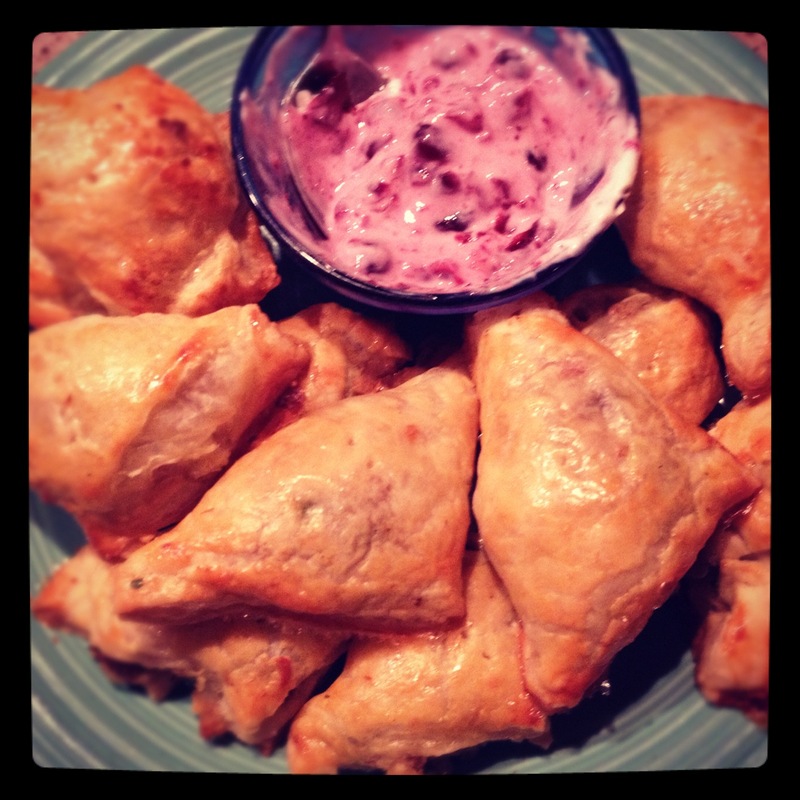 Leftover Thanksgiving Samosas with yogurt-cranberry sauce. But these Samosas are AWESOME. I was convinced they were going to turn out terrible, as I was literally mixing all of our leftovers together with a few exotic spices like cilantro and curry powder. Plus, I am not too graceful with the puff pastry dough. Once they came out of the oven, they got rave reviews. All of your leftovers are hidden in a cute little puff, and leftover cranberry sauce mixes great with plain greek yogurt as a dip. Mix leftover mashed potatoes, stuffing, turkey, and cooked vegetables (such as carrots or green beans) together in a large bowl. Add a dash of curry powder and ground ginger. Add a tablespoon of chopped cilantro and season with salt and cayenne pepper. Roll a sheet of puff pastry into a 14-inch square, then cut into 25 smaller squares and place 1 tablespoon filling in the center of each. Or, if you are me, totally butcher this process and make uneven squares that come nowhere close to totaling 25. Don’t worry, the result thankfully still turns out well even if you aren’t gifted in the pastry design department. Brush the edges with a beaten egg (or, if you are me, the entire pastry) fold into triangles and press to seal. Bake at 350 degree until golden brown, 20 to 25 minutes. Mix yogurt with leftover cranberry sauce for dipping. 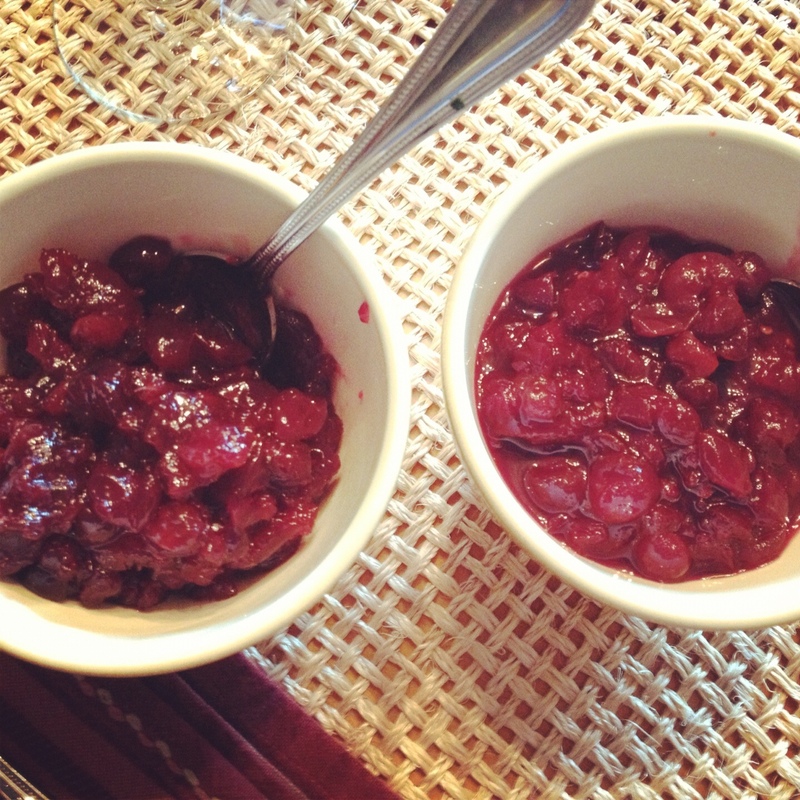 Bourbon Cranberry Sauce and Pomegranate Cranberry Sauce. Preheat oven to 350°F. Combine first 3 ingredients in 9×13-inch baking dish. Cover tightly with foil and bake until cranberries are tender and sugar is dissolved, stirring once, about 1 hour. Remove from oven and stir in bourbon. Refrigerate cranberry sauce until well chilled. (Can be prepared 1 week ahead.) Transfer to bowl and serve. Combine all ingredients in a medium saucepan and cook over medium-low heat for 20 minutes, stirring occasionally to prevent burning. Mixture will thicken as it cooks, and will thicken more as it cools. Once off the stove, add the onion and red pepper flakes.